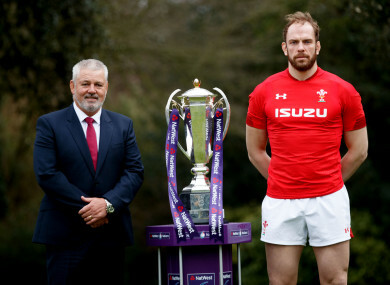 Wales head coach Warren Gatland and captain Alun Wyn Jones at last week's launch of the Six Nations. WORCESTER WING JOSH Adams will make his Wales debut in Saturday’s Six Nations opener against Scotland, with head coach Warren Gatland forced to juggle his resources because of injuries to key players. Adams, this season’s English Premiership top try scorer, will feature on the right-wing in Cardiff in a starting line-up that includes 10 Scarlets players. Rhys Patchell is handed the fly-half role instead of the injured Dan Biggar but there is no place in the match-day 23 for Northampton wing George North. Wales are without several injured senior players for the Scotland clash including Biggar, Sam Warburton, Jonathan Davies and Rhys Webb but there is a recall for fit-again Gloucester back-row forward Ross Moriarty. Moriarty packs down at number eight alongside Aaron Shingler and Josh Navidi in the back-row, while Scarlets’ Kiwi-born centre Hadleigh Parkes retains his place following an impressive try-scoring Test debut against South Africa in the autumn internationals. “The first-up game against Scotland this weekend is really important for us, and this is a great chance for this group of players to get us off to a good start,” said Gatland. - This article was updated at 2.05pm to correct the line-up of the Welsh forwards. Email “Injuries hit Wales hard as Gatland hands debut to winger for Cardiff opener against Scotland”. Feedback on “Injuries hit Wales hard as Gatland hands debut to winger for Cardiff opener against Scotland”.